$29 when rented with an inflatable! This really cool frog flinger carnival game is really fun for younger kids and the object is to put the rubber frogs on the catapult and fling them over the pond and land on the lilly pad. But just watching the frogs fly is enteraining enough for small children. 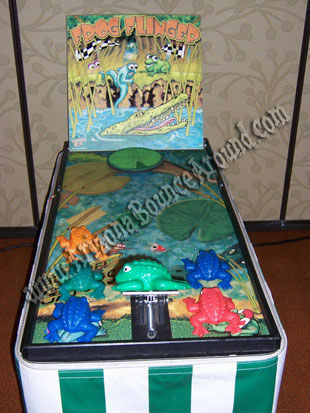 This carnival game includes 6 rubber frogs and carnival themed skirting. This game is availabe for delivery or customer pickup. This is a 4 foot long table game and stands on it's own legs so you can put it almost anywhere. You can play it however you like but we supply everything needed for play. Everyone will love this carnival game so rent one for your next carnival themed party or event.